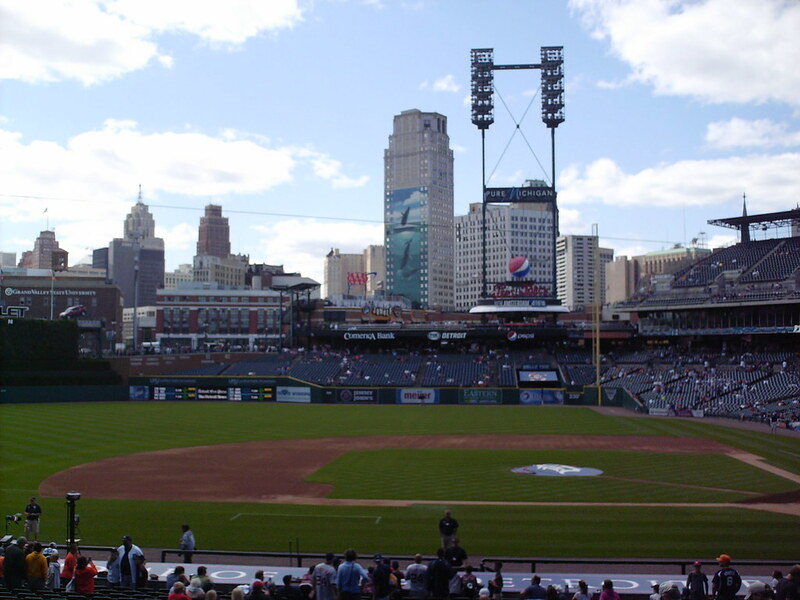 The view from behind home plate at Comerica Park. 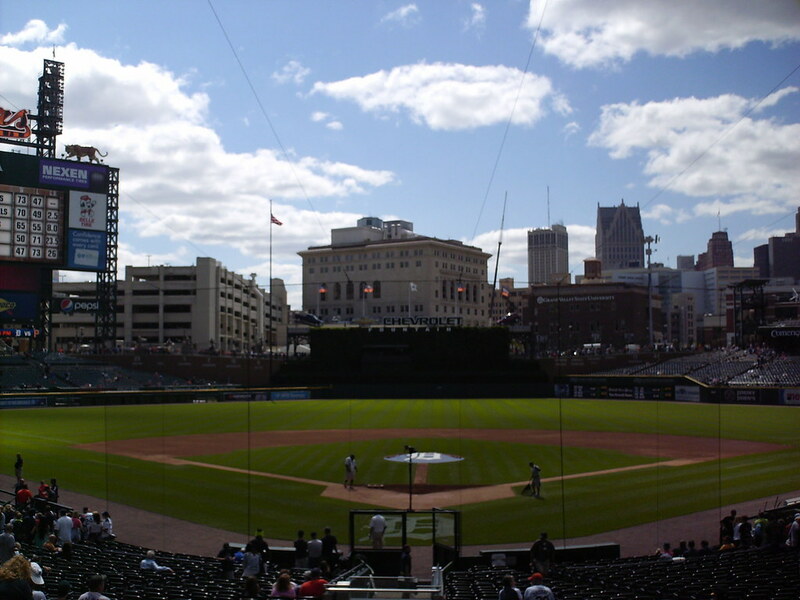 The grandstand at Comerica Park as seen from center field. The pressbox behind home plate, with luxury suites to either side and above, and cushioned wooden chairs in the infield boxes below. 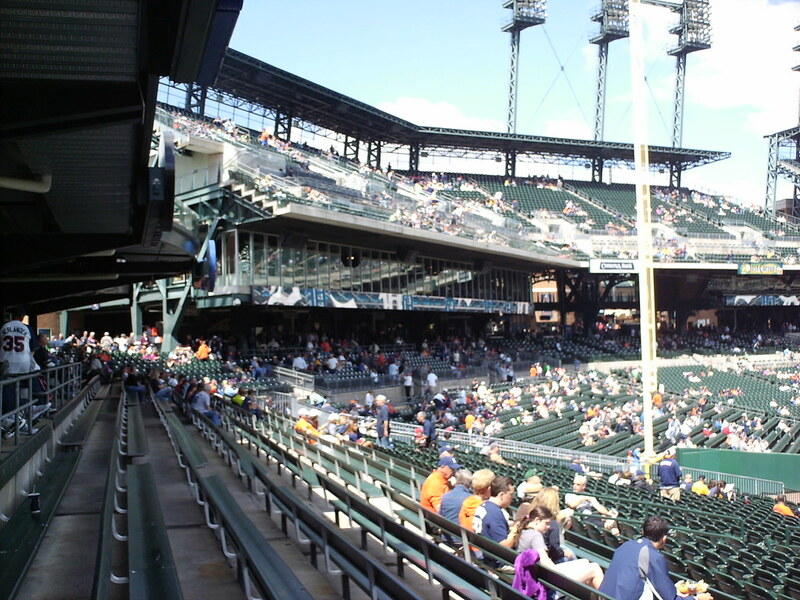 The upper deck in the right field corner is separated from the main seating bowl and one level closer to the field than the rest of the upper deck. 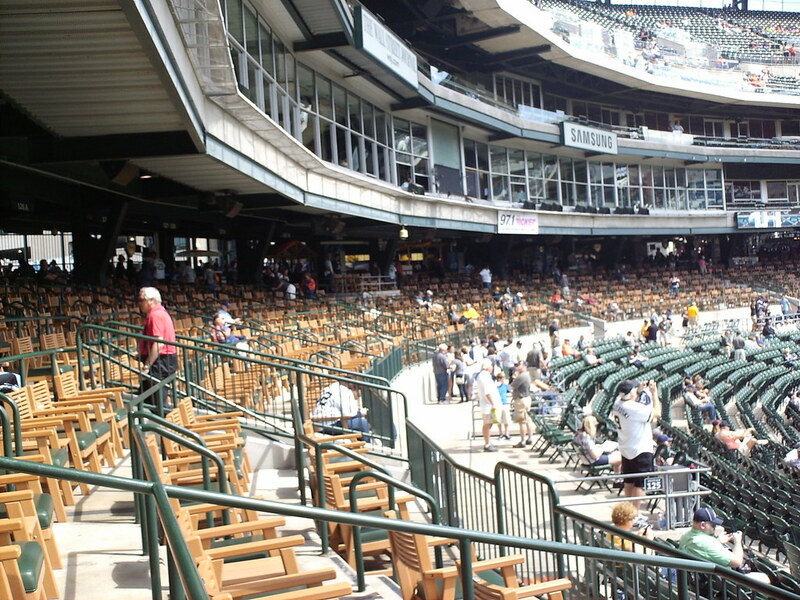 An enclosed restaurant hangs from underneath the upper deck in the right field corner. 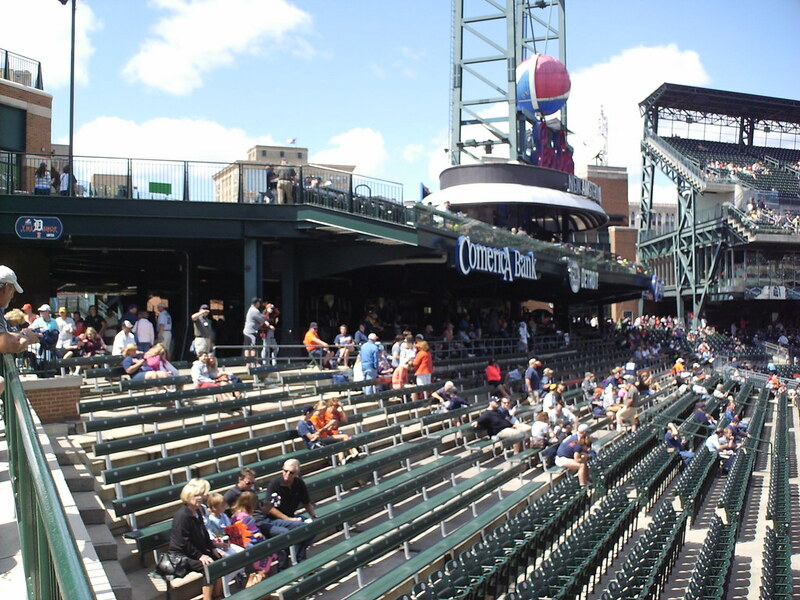 The Pepsi Porch features rooftop and group seating and extends out over the right field bleachers. 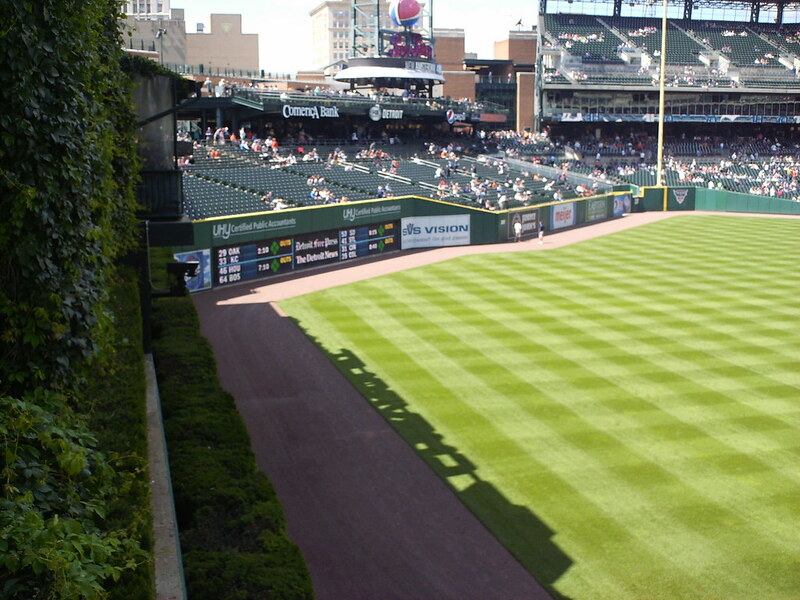 The right field bleachers extend out into the field of play. 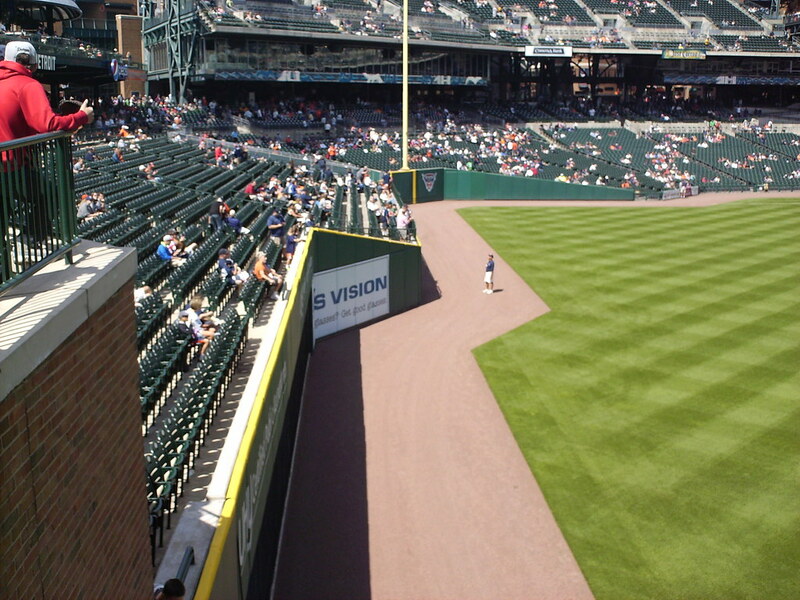 When the ballpark opened the bullpens were located in that area before being moved to left field in 2003. 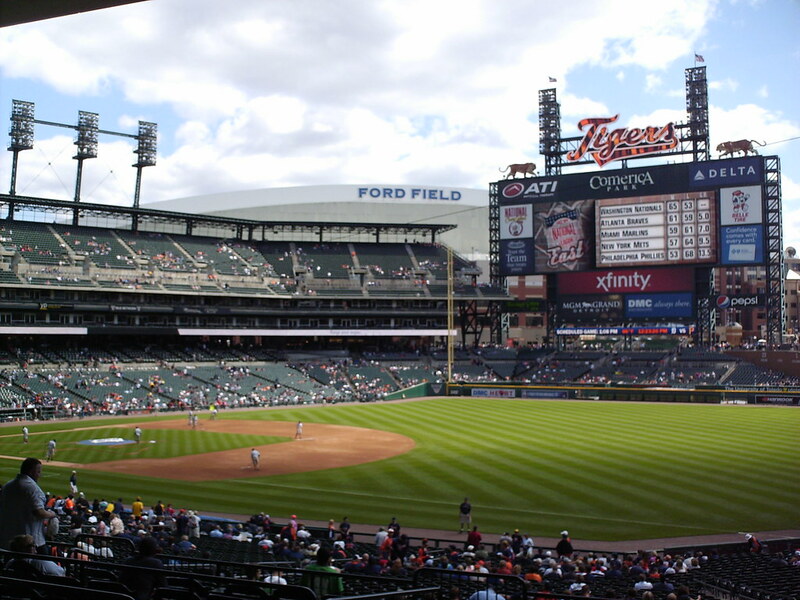 The NFL's Ford Field overlooks the ballpark from behind the left field corner. 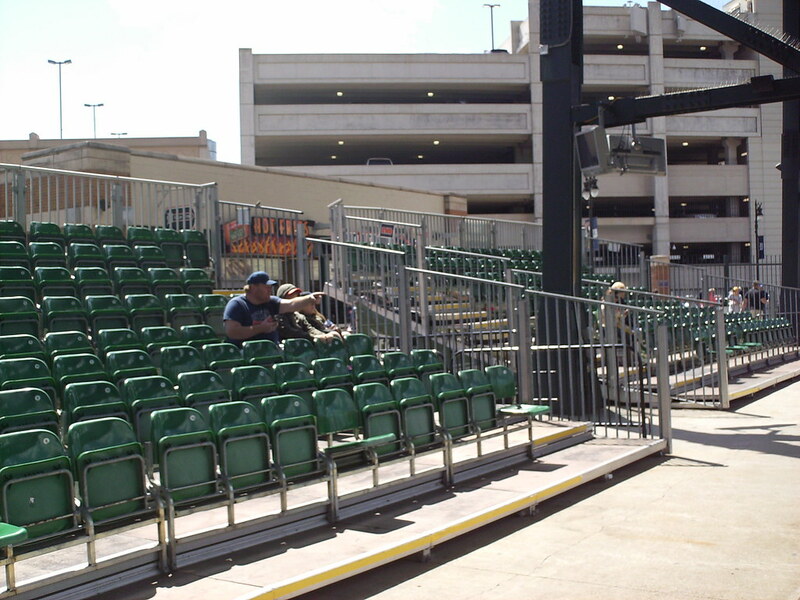 Movable bleacher seating underneath the scoreboard in left field. 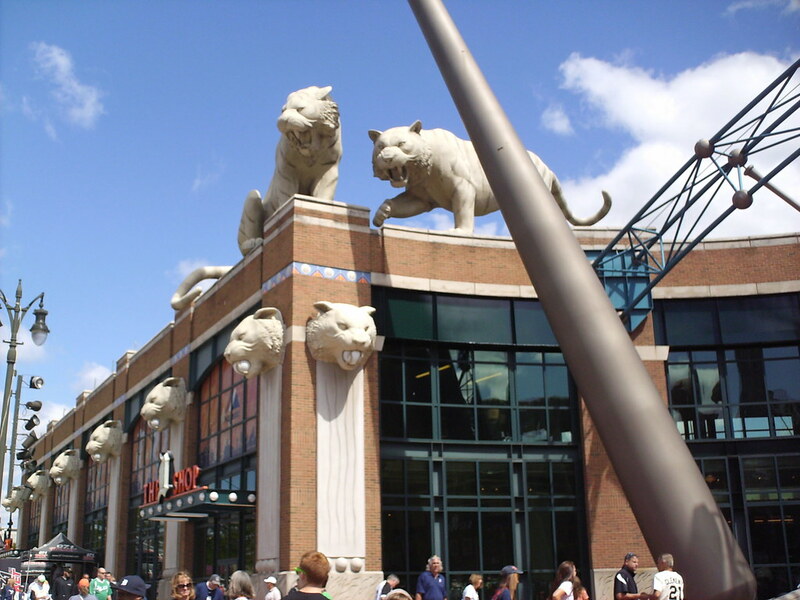 Tiger sculptures and tiger head gargoyles decorate the outer facade of Comerica Park. 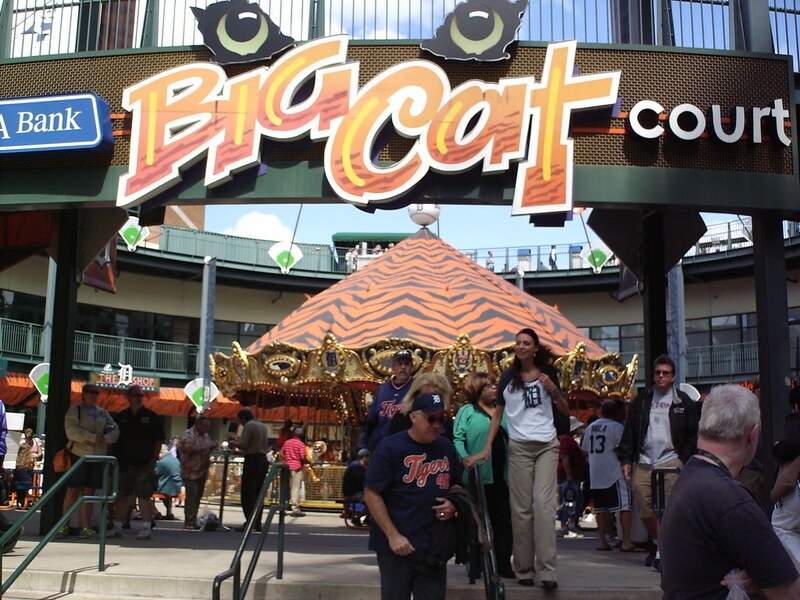 The Big Cat Court plaza area features a carousel and concession stands in an open courtyard. 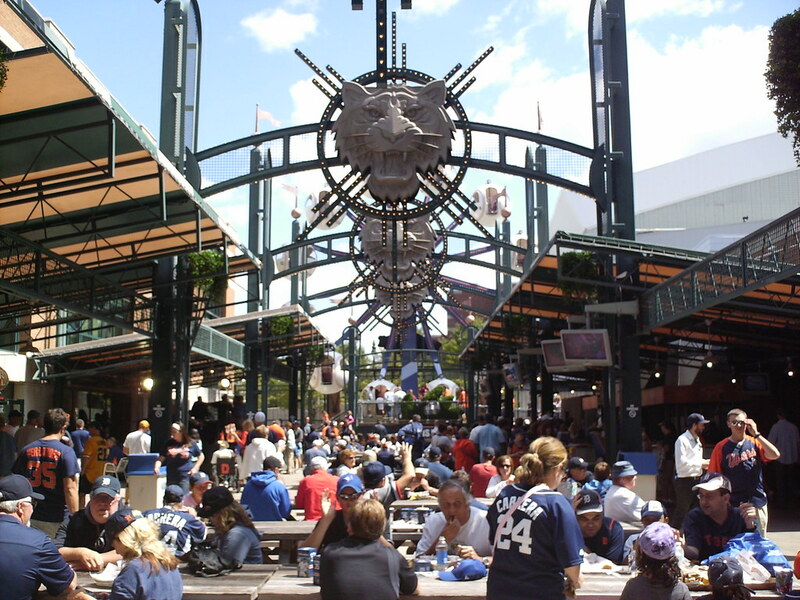 A courtyard off the main concourse features a baseball themed Ferris Wheel, restaurants and a beer garden. 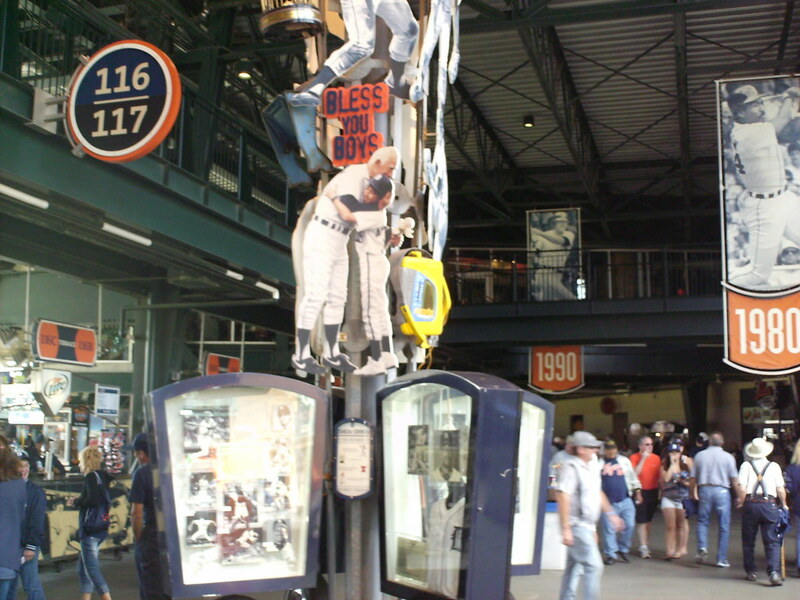 Displays along the main concourse celebrate different decades in Tiger history. 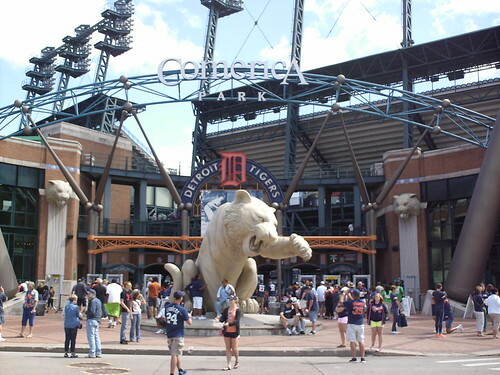 Comerica Park features a large fountain in center field and both bullpens in left. 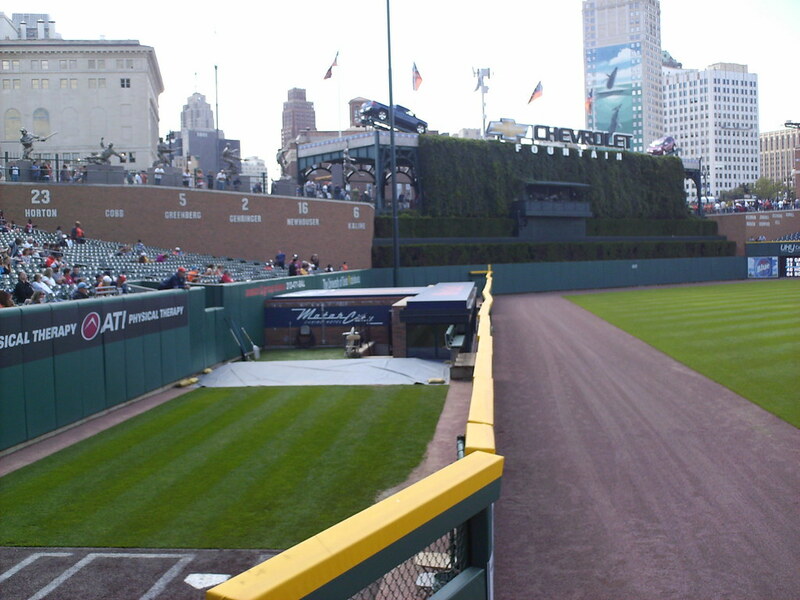 The green wall at the back of the bullpen was the original outfield wall before the bullpens were added to shorten the field dimensions in 2003. 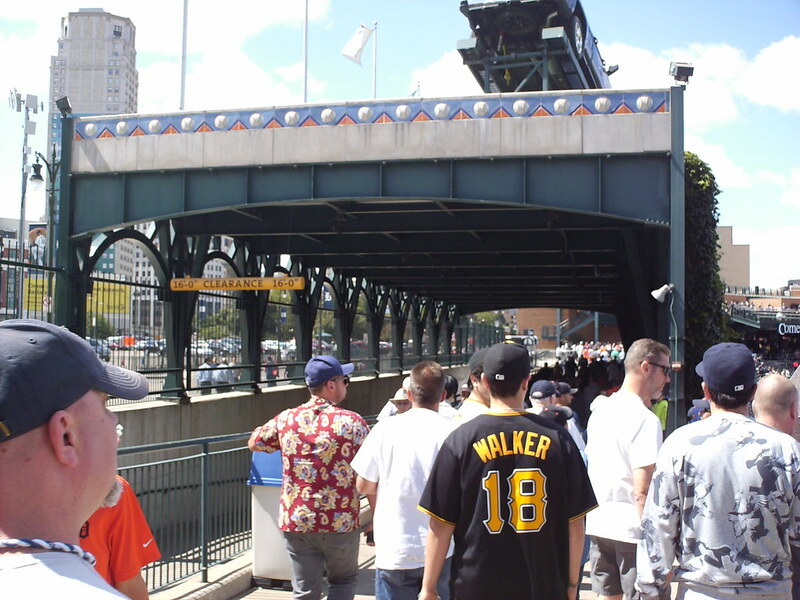 A pedestrian bridge and vehicle entrance to the area underneath the ballpark sit behind the fountain in center field. 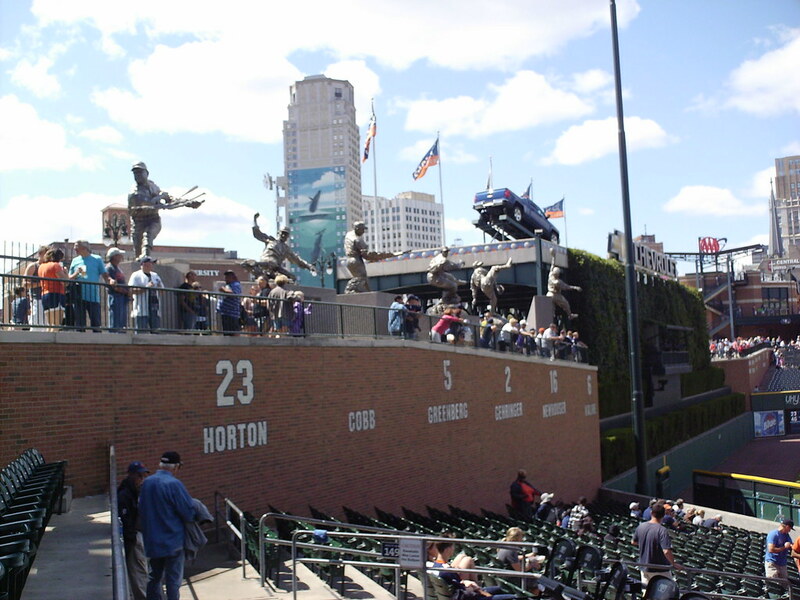 Statues and retired numbers of former Tiger greats on the left field side of the fountain. 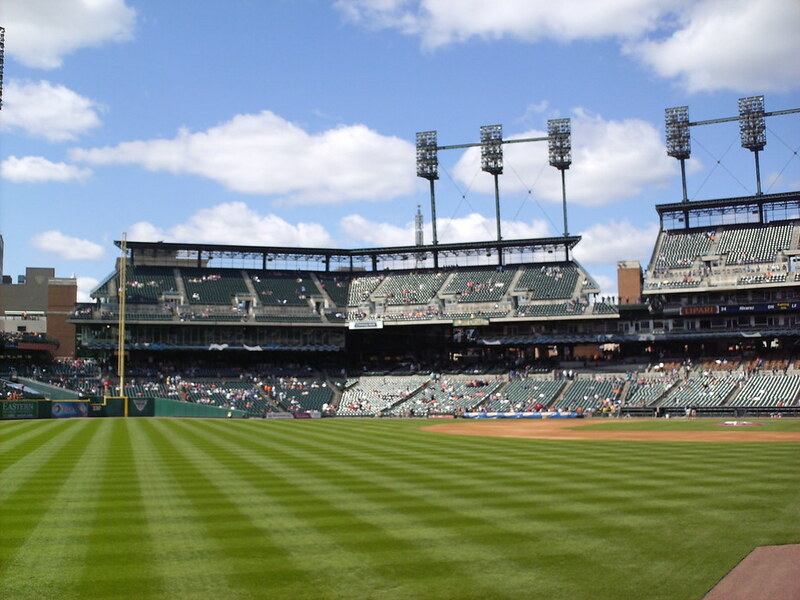 A blank space sits in the area where Ty Cobb's number would be as he played in the era before uniform numbers. More retired numbers and a wall of fame on the right field side of the fountain. 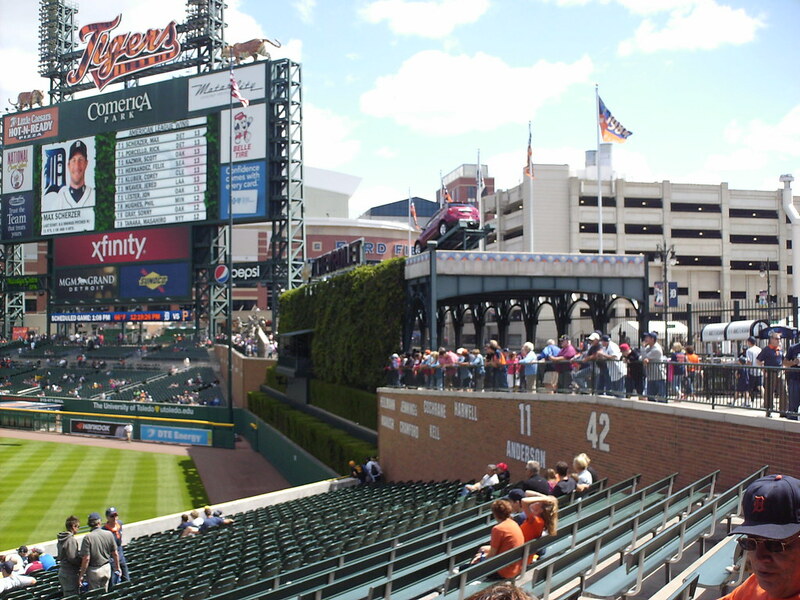 The flagpole in center field was in play when the park opened before the bullpen wall was added in front of it. 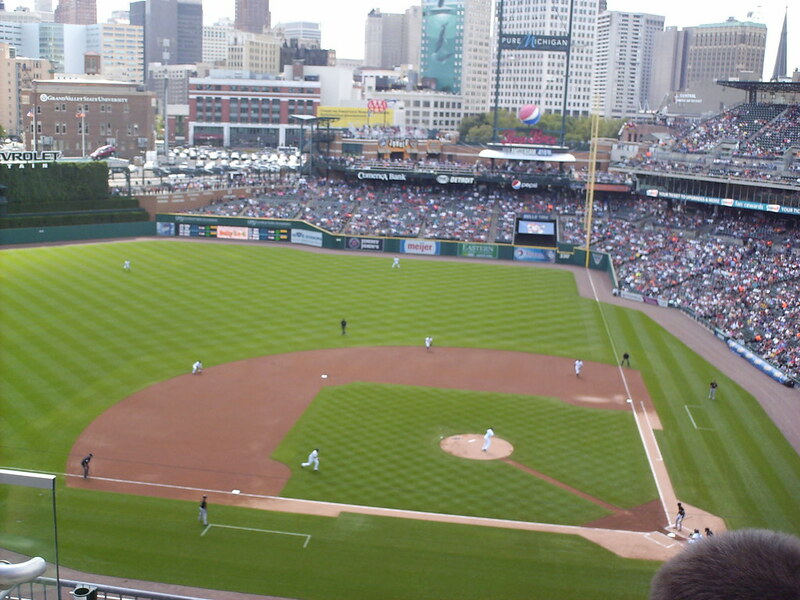 The playing field at Comerica Park as seen from the upper deck. 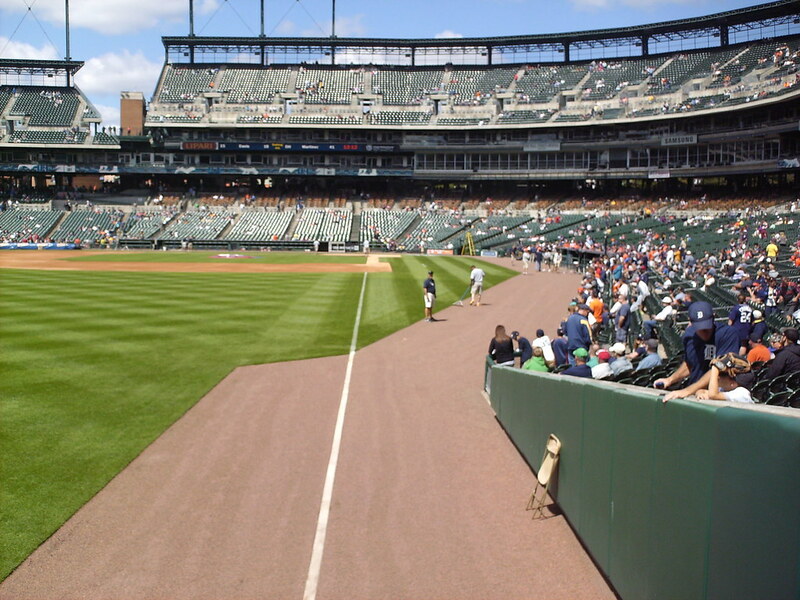 The field is one of only 2 in MLB to feature a dirt path from home plate to the pitcher's mound. 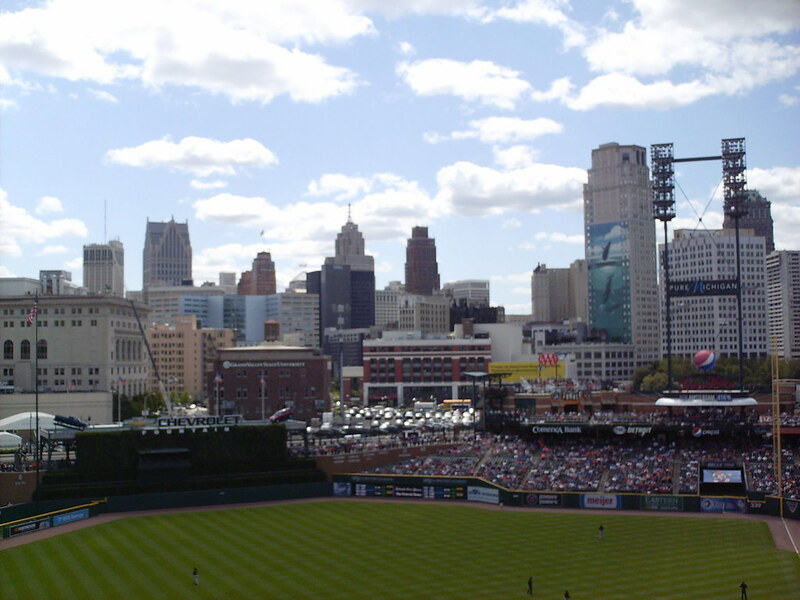 The Detroit skyline as seen from the upper deck at Comerica Park. 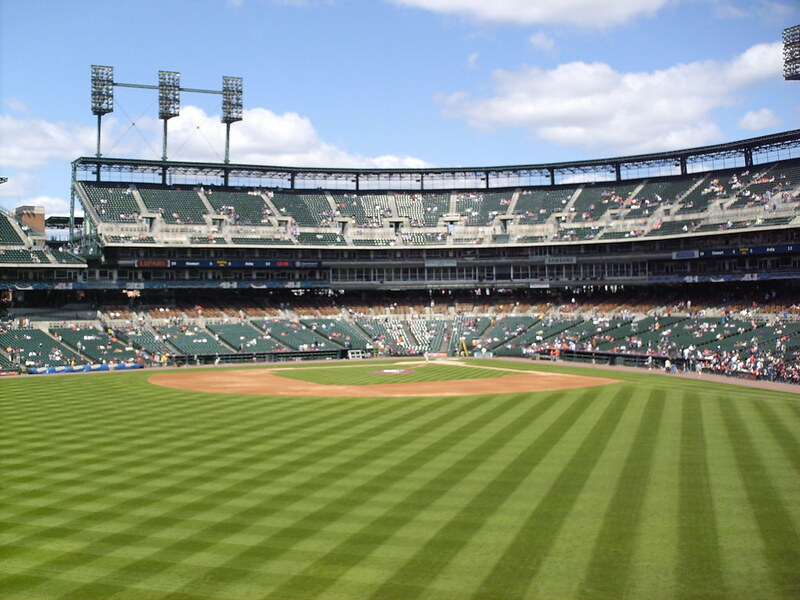 The stands curl back in toward the field in the outfield, leading to less foul territory there than in the infield. 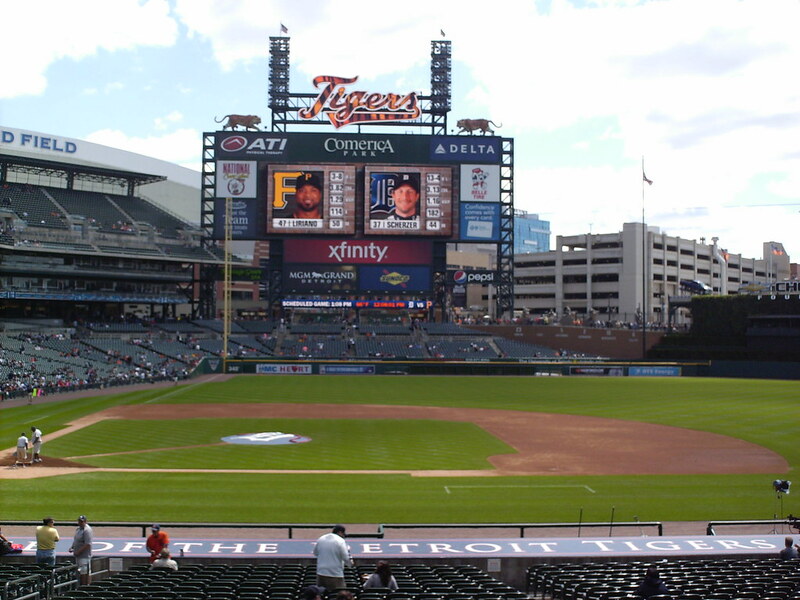 The curves of the outfield wall and the auxiliary scoreboard in right center field. 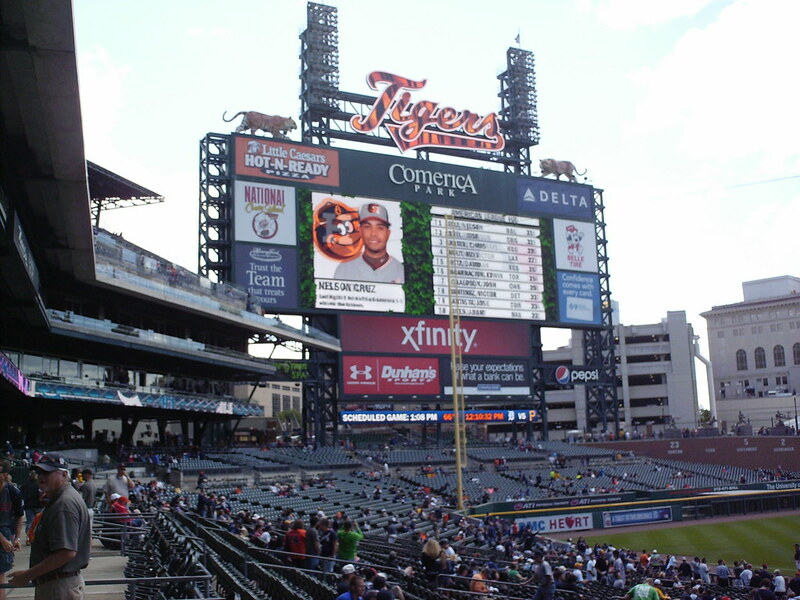 The massive video scoreboard in left field, flanked on top by two prowling tiger statues. 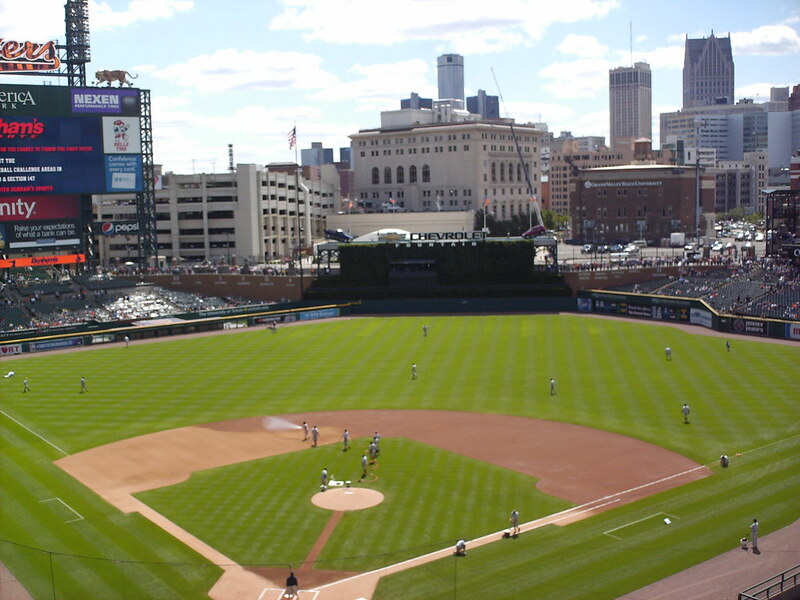 The Detroit Tigers on the field during a game at Comerica Park. 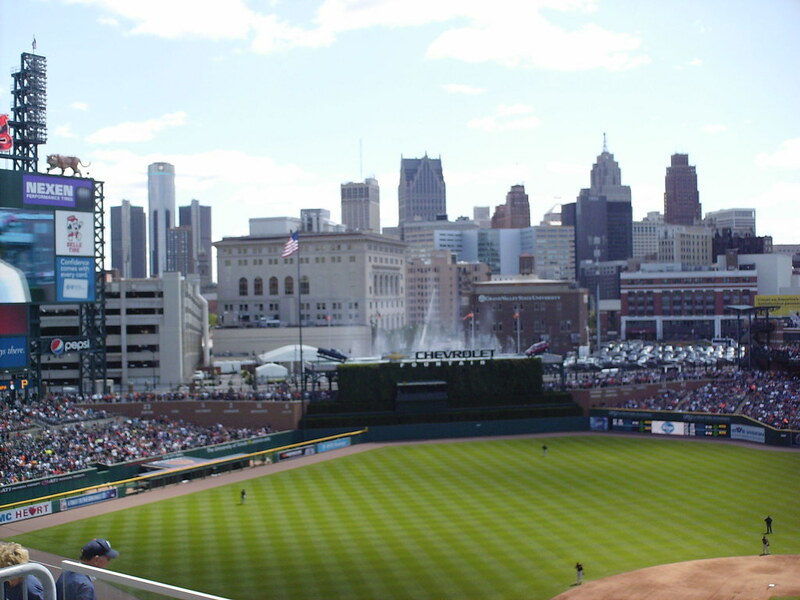 The center field fountain goes off after a Tigers homerun during a game at Comerica Park.